A farmer checks for bagrada hilaris, also known as painted bugs, on his lettuce at a farm in Penaflor, near Santiago, Chile, April 7, 2017. 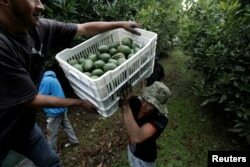 Latin American agriculture needs to become more technologically savvy and be rebranded as a source of jobs, in a bid to improve the lives of small-scale farmers and stop the drift toward cities, a senior agricultural official said. Combining smart technology with ancient methods may also help ease climate change effects, which are set to increase the risks facing the region's poorest farmers, said Manuel Otero, head of the Inter-American Institute for Cooperation on Agriculture. "Agriculture and rural areas sometimes get a bad press. ... We have to communicate a new vision and revitalize agriculture as a dynamic sector," said Otero, who recently took over as director general of the agency that helps governments across the Americas develop farm policy and manage rural development. "Independent of the contribution of agriculture to GDP, it is a strategic sector — food security and global environmental sustainability depend on it," he told the Thomson Reuters Foundation in a telephone interview from Costa Rica. Among the "mosaic" of countries in the region, a stark contrast persists between major food exporters such as Chile and Argentina and those where many struggle to produce enough food. 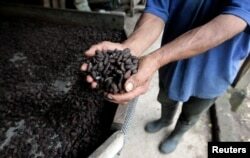 A man examines cocoa beans at La Calera farm in Granada, Nicaragua, July 21, 2017. The last hurricane season showed how vulnerable Caribbean islands such as Dominica are to extreme weather exacerbated by climate change, while farmers in Central America's "dry corridor" are at risk from worsening droughts, said Otero. Rural poverty and limited access to land have fueled migration to Latin America cities, now home to 80 percent of people in the region, as well as north to the United States. Family farmers are the "backbone" of Latin America's agriculture, and they need support to help them work cooperatively and adopt technologies that can process their crops into higher-value products, said Otero, a vet from Argentina. Smarter use of technology would enable farmers to intensify production to meet increasing food demand from growing populations without expanding farmland and causing greater environmental damage, he said. Reducing the amount of food wasted on the journey from field to plate would also help feed more people, as climate change increases extreme weather and brings more crop infestations and disease, he added. Farmworkers load crates of freshly picked avocados into a truck at a plantation in Tacambaro, in Michoacan state, Mexico, June 7, 2017. "Before, the only objective was to maximize economic benefits, but now we maybe have to give up some of the economic benefits to try to be more respectful to the environment," he said. The U.N. Food and Agriculture Organization says a 50 percent jump in global agricultural production is needed to support a projected world population of nearly 10 billion people by 2050. In the world's most unequal continent, where large swaths of land belong to industrial farms, plantations and ranches, barriers to land ownership make the poorest farmers more vulnerable, Otero said. Farmers renting parcels of land for short periods also have little incentive to protect the local environment, he said. Ancestral techniques such as terracing to prevent soil erosion and drip irrigation to maximize scarce water supplies could be combined with technological solutions to make agriculture more resilient to a changing climate, Otero said. Switching agricultural chemicals for microbial alternatives could also reduce soil degradation, he said, underlining the need to integrate forest management better with crop and livestock farming. "There is a new equilibrium in agriculture that necessarily has to be in better harmony with nature so that we can maintain and hopefully increase high yields but, above all, preserve natural resources for future generations," he said.